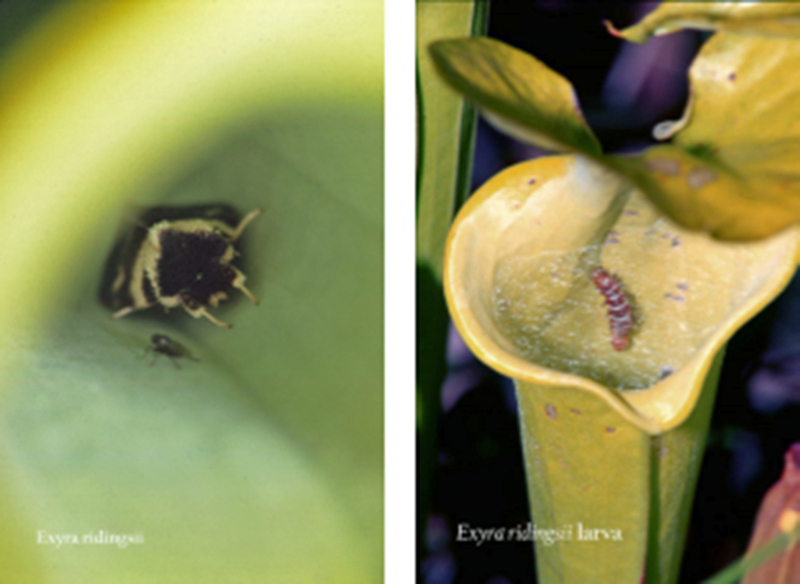 Pitcherplants are becoming rare, and the insects that depend on them are rarer still! Pitcherplants were once widespread in the Coastal Plain and Piedmont of North Carolina. For many centuries these plants thrived in sunny open boggy spots. The landscape has changed over the past 400 years as swamps have been drained or filled, and suppression of once-frequent ground level fires has allowed trees to grow large, which has shaded out many remaining boggy areas. Pitcherplants still grow well in old mill ponds and in areas where fire has been reintroduced. So all we need to do to keep the remaining pitcherplants healthy is preserve a few millponds and reintroduce fire to the landscape on a periodic basis and all will be well—right? Actually, that’s not the case. For example, the endangered pitcherplant moth is easily overlooked, though it is worthy of protection. As pitcherplants have declined, so too have the moths of the genus Exyra, which are three species of specialists that actually live inside the pitcherplants. A fire sweeping across a bog will burn only the tops of the pitcherplants, which then soon grow back from the extensive root system underneath the moist sphagnum moss at the soil surface. When this happens, though, the tiny moths inside the pitcherplants get burned up. When pitcherplant bogs were scattered thickly across the landscape, it didn’t matter so much if these little moths were wiped out by fire in one specific bog. Moths from other nearby bogs would soon fly over and recolonize the pitcherplants in the burned bog. Now that these sites are so widely scattered on the landscape and are very small compared to their former extent, it’s hard for the moths to come back after a burn wipes out a population. So how far can they fly? 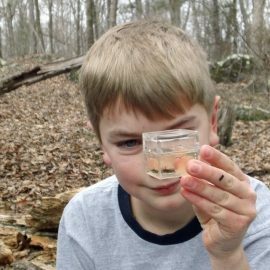 We don’t know yet, but a couple of miles seems to be too far in Moore County, North Carolina, where pitcherplants at Weymouth Woods State Park have only one species of moth (Exyra ridingsii)—in spite of the fact that there is a population of another species only 2.5 miles away. 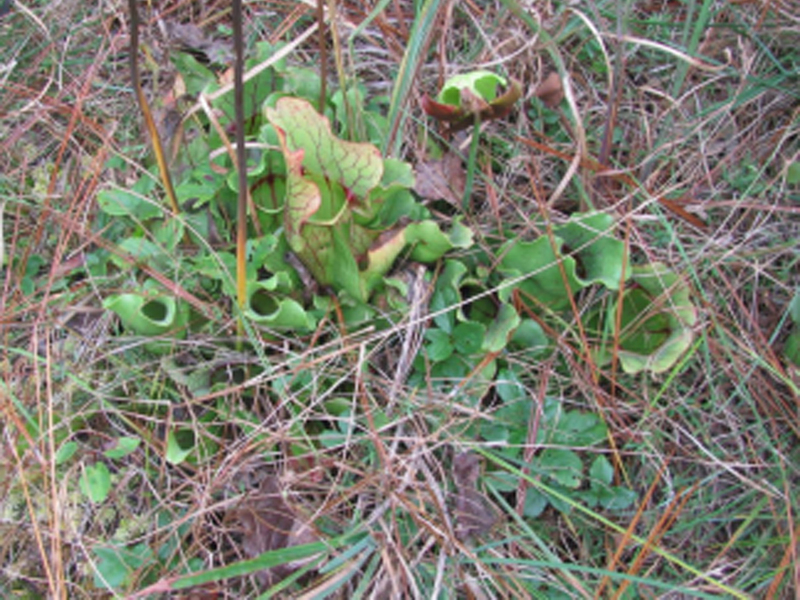 Two species of pitcherplants grow in the Piedmont of North Carolina: the northern pitcherplant (Sarracenia purpurea) and the yellow pitcherplant (S. flava). This area is the edge of their natural range and they have become very uncommon in this area, due to fire suppression and habitat loss. 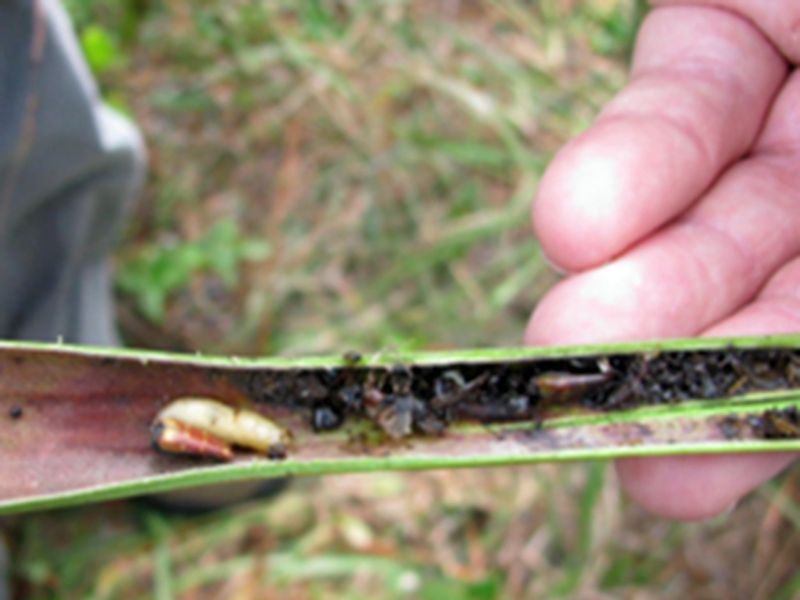 In the winter of 2010, a group of zoologists and botanists visited known pitcherplant bogs in Montgomery County, North Carolina on both public and private lands, looking for pitcherplants and for feeding damage that would indicate the presence of moths. Most of the sites had no pitcherplants, or just one or two, and had no moth signs. 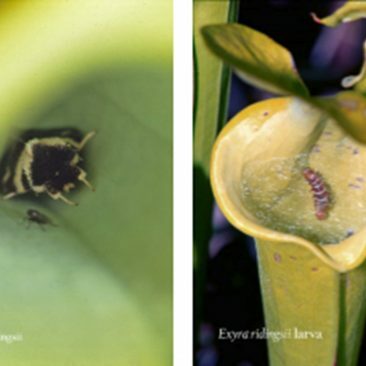 By far the best site, which includes many pitcherplants of two different species plus a hybrid between the two, was Black Ankle Bog, a Nature Conservancy (TNC) Preserve that is burned about every three years. One species of moth is present there; also present are sarcophagid flies (Sarcophaga sarraceniae). Sarcophagid flies live inside the pitcherplants too. Their larvae feed on the dead bugs in the bottom of the pitcherplants, and mature flies shelter from cold nights in the tops or in the flowers, which have openings exactly the right size for these small flies. The sarcophagid flies were probably important pitcherplant pollinators in times past. Now that TNC is aware of these unusual insects at Black Ankle Bog, it will make sure that only a portion of the pitcherplants get burned at one time, thus preserving some of the dependent insect population at all times. Of the dozen or so current or former pitcherplant sites in Montgomery County, 10 are within one mile of at least one other site, so there exists the potential for supporting a moth population that extends to more than one site. The next step in the process is to choose some of these sites and locate resources to begin restoration to increase pitcherplant populations. Many conservation partners are interested in this project, including members of the Greater Uwharrie Conservation Partnership and the North Carolina Natural Heritage Program. 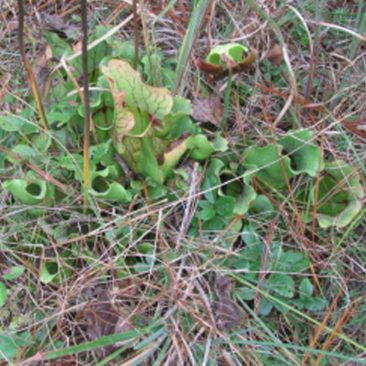 The Zoo’s experience with cultivating rare pitcherplants may help with restoration of healthy pitcherplant populations. 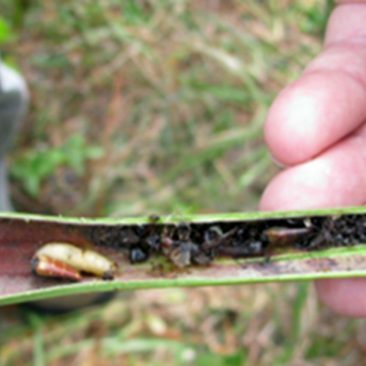 If management increases the number of pitcherplants enough to sustain the moths, then they could return or at least be reintroduced.